According to the 25th edition of Euroconsult's report, Satellite Communications & Broadcasting Markets Survey, due to be published later in September, the FSS industry continues to move towards telecom/data markets, as wholesale revenues derived from video markets continue to erode. Based on the latest market projections, wholesale capacity revenues from telecom applications will surpass video applications by 2021. The growth is largely supported by the influx of low cost capacity from new VHTS systems and NGSO broadband in the coming years. As a result, total capacity supply is projected to grow eight-fold from 1.3 Tbps in 2017 to nearly 10 Tbps by 2022. The growth acceleration in HTS capacity demand confirms Euroconsult's view of the market shift from regular to HTS and the increasing demand for telecom applications. HTS capacity leased increased to around 594 Gbps in 2017, a new record high, and a clear acceleration (+36 percent, y-o-y) in take-up across all telecom verticals. HTS capacity growth was driven by several factors, including increasing capacity usage for consumer broadband and backhaul as new system launches facilitated growth across multiple global regions. In addition, a number of operators succeeded in leasing entire payloads, which resulted in a stepped increase of the initial growth phase in certain markets. The net growth in capacity usage in 2017 did not result in revenue growth as the FSS industry is still absorbing the impacts of the recent capacity price resets. Leased regular capacity decreased for the first time in more than a decade to around 6,920 TPEs in 2017. Growing requirements for video distribution, MILSATCOM and aero IFC are expected to mute regular capacity erosion until 2020. 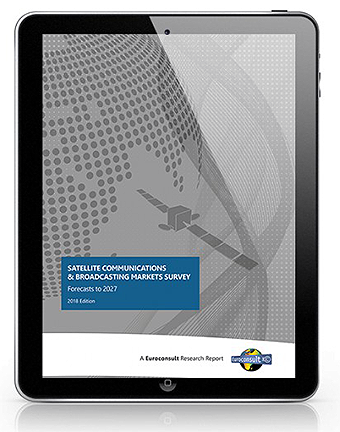 Now in its 25th edition, Satellite Communications & Broadcasting Markets Survey is the definitive business planning tool supporting investment decisions in the satellite industry. This latest edition includes increased data coverage on local developments and deeper coverage of business trends. Released annually, it provides the most complete and accurate picture of market conditions and extensive, insightful analysis of market trends. Pacôme Révillon, the CEO of Euroconsult, commented that innovations in technology, services and in the ecosystem will make satellite connectivity relevant in the context of the communication sector of the 2020s that will see the spread of terrestrial 5G and the rollout of a wider range of communication services, either between humans or driven by IoT exchanges. In the short term, the impact on legacy services and the related pressure on the economic performance of operators could be unfortunately described as a necessary pain, and is certainly no different from the cycles observed in other industries navigating a breakthrough innovation period.